Green manures are a crucial part of a successful organic crop rotation. When managed well, they increase soil fertility, soil health, biodiversity, provide erosion protection, and decrease weed populations. Sometimes called plough downs, or the more general name of cover crop, green manures are planted and not harvested for seed, but instead incorporated back into the soil. When green manures are growing throughout the season, they are capturing carbon from the atmosphere. Some of the carbon is incorporated into the plant material that we see above the ground, while some goes below the ground into the roots and is released as root exudates into the soil. These exudates feed soil biodiversity, contribute to soil organic matter, and improve soil structure. It is very important to include legumes in your green manures, because they fix nitrogen from the atmosphere. Legumes in green manures are in fact a major source of nitrogen in organic cropping systems. Like carbon, the nitrogen is incorporated into the plant, and also released through root exudates, again creating a rich soil environment. When the green manure is terminated (this can be done by tilling, mowing, rolling, or grazing, but more on that later), the green manure starts decomposing. As it decomposes, it releases all the nutrients that are in the plant, both above the ground and in the roots. These nutrients that are released feed soil organisms and are also bound up by the soil (for future crops to use). The decomposing plants therefore increase the amount of carbon and nitrogen in the system. More carbon means more soil organic matter, means more soil biodiversity, means better soil structure, means better soil health. In order to get the most benefit from your green manure, you want to create as much plant material as you can, so that you have optimum nitrogen and carbon, as well as good weed competition and soil cover. How can you do that? Well, this question needs to be first answered with a few questions. For example, where are you farming and what are the legumes that grow best in your region? What are your moisture limitations? Where in your rotation are you growing your green manure, and do you want to grow an annual, biennial, or a perennial? To help with these decisions, check out: Legume Green Manuring – Government of Alberta and Cover crops and green manures in organic production – OACC. After narrowing down your legume species, you can setup your green manure for success by choosing the right seeding rate (which will depend on your green manure species choice) and by always inoculating your legumes. Proper inoculation increases the amount of nitrogen that will be fixed. Always consider growing more than one species in your green manure. For example, growing peas together with oats gives the peas something to grow on. Also, consider your weed control. One strategy is to seed early to get ahead of the weeds, while another is to wait for a flush of weeds, till, and then seed the green manure. Farmers use both strategies, and must balance their timing. In some cases they want to get the green manure into the ground as soon as possible for maximum biomass, or in the case of warm season crops they may try to plant a little later for high biomass, while also taking the opportunity for weed control. 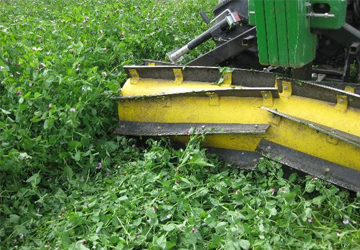 How you choose to terminate your green manure can vary, and depends on equipment availability and conditions on the farm. There is no hard and fast rule about how to terminate, as each option has its pros and cons. Incorporating your green manure with tillage allows the plant material to be mixed into the soil, which promotes even decomposition and a large N contribution to the following year’s crop, while leaving some residue on surface. Tillage also allows for weed control, especially of difficult perennials such as Canada thistle. However, some farmers are looking to reduce tillage or move away from it entirely. This is where you can consider mowing, blade rolling, or grazing. Mowing helps break up residue, and the mulch that remains provides soil coverage, and if thick enough, can suppress weeds. Keep in mind, when the plant material is not incorporated, there is slower green manure decomposition and N release, with a potential nitrogen loss to the atmosphere. Blade rolling uses less fuel and also leaves a rich mulch on the surface of the soil. And if you have access to animals, grazing is an excellent way to utilize green manures as well as cycle available nutrients. Once again, there is no hard and fast rule about termination, and combining various methods might be the best option for your farm. If using warm season plants, seeded later, winter can terminate for you. Stalks can be grazed, or left for snow trapping, and they can be incorporated in the spring. Green manures can be managed in diverse ways that best compliment your farm. Taking the time to pay attention to your green manures will pay off in crop yield, crop quality, and soil health. At the Prairie Organic Grain Initiative, we would like to hear how farmers are managing their green manures. What’s working? What are your challenges? You can email iris.vaisman@prairieorganicgrain.org if you would like to share.